VW's first stand-alone EV will be a Golf-sized model based on the I.D. concept, shown. FRANKFURT – Volkswagen Group will start deliveries of its first stand-alone battery-powered models in 2020, around the time that Tesla wants to hand over 1 million vehicles a year. So why does the German carmaker think it can stop the U.S. electric-auto pioneer in its tracks? What Volkswagen lacks in first-mover advantage, the German company can make up in global scale and manufacturing expertise, says Herbert Diess, who oversees the carmaker's namesake brand. VW today is the world's biggest automaker, a long yearned-for status it grabbed from Toyota Motor Corp. last year, and Diess wants to claim another crown by making electric vehicles accessible to mass-market buyers, he said in an interview. "We see Volkswagen as the company that can stop Tesla, because we have abilities Tesla doesn't have today," Diess said in Frankfurt. Tesla has become the de-facto benchmark for established car producers from Daimler to BMW Group to VW seeking a larger slice of the electric-auto market. And while founder Elon Musk has captured consumers' appetite with Tesla's Model S sedans and Model X SUV, he's been unable to shake questions of whether he can fulfill ambitious production pledges in coming years. That may provide an edge for companies such as Volkswagen, which churns out more cars across its dozen brands in two days than Tesla sold in all of 2016. 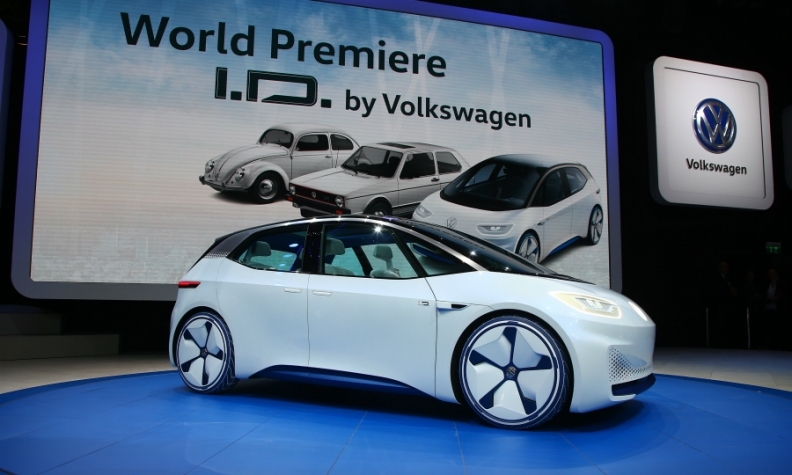 In recent weeks, Diess said, VW has signed off on the final design of the electric I.D. lineup's first model, a hatchback similar to the marque's best-selling Golf. The car, dubbed the Neo, will be targeted at the European market, priced along the lines of the Golf's diesel version, and have a range of as much as 600 kilometers (370 miles) on a full battery. By 2023, the subbrand will add the Crozz compact crossover for worldwide sale including in China, VW's largest market, as well as the Lounge, a more spacious SUV with a longer wheelbase than the Crozz to appeal to American consumers. A sporty four-door sedan, the Aero-e, will compete with Tesla's Model S.
Manufacturers are developing battery vehicles in response to regulators' tightening emissions restrictions that apply across their product lines, particularly new European Union rules set to start taking effect in 2020. Volvo outlined plans on July 5 to phase out cars that rely soley on combustion engines early in the next decade, and the French government set out environmental policies to eliminate gasoline and diesel as vehicle fuels by 2040. Electric models have yet to catch on with buyers: the Renault -Nissan alliance, the biggest producer of the cars, hasn't come close to meeting sales goals for the vehicles, and Tesla continues to burn cash as delivery growth goes flat. BMW has scaled back plans for its stand-alone "i" electric subbrand, which has no predecessors in its traditional autos, and won't be adding to it before 2021. While Musk said this week that Tesla will ramp up production of its new Model 3 to 20,000 cars a month, the manufacturer's quarter-by-quarter deliveries weakened. So far, no automaker has generated returns from electric cars similar to those reaped from combustion-engine vehicles, because of high spending on power-storage technology. Volkswagen's growth into a market leading behemoth of 12 vehicle brands, including the Audi and Porsche premium nameplates, has also burdened it with a slow-moving bureaucracy that's far from an early adopter of new trends. The VW marque is only now adding to its SUV offerings, missing out on a burgeoning segment that's generated healthy margins for rivals including Toyota and General Motors. The cost of following the industry shift to electric cars poses an additional burden on Volkswagen, which is also spending billions of euros to resolve its 2-year-old diesel-emissions scandal and reorganize its corporate structure for speedier decision-making. "We have to watch out, because we have a lot of work in front of us," Diess said, "and the challenges that lie ahead are enormous."